Blackjack Facts Trivia for the most popular casino game worldwide online and off begins with a little history. Though it is widely believed that the French discovered Blackjack, Italians equally claim their rights over the invention of blackjack. The casino game of Blackjack was originally named vingt-et-un which is French for 21. The English version of Blackjack is Pontoon. Napoleon was an avid player of 21, even after his exile. A rule variation coined the term blackjack as payouts went to the player who held the Jack of Spades. Blackjack arrived in America after the French Revolution. Blackjack was banned in the United States at the beginning of the 19th Century until 1931. In 1978, the Sahara Hotel and Casino was the first casino to hold a blackjack tournament. Televised blackjack tournaments include Ultimate Blackjack Tour and World Series of Blackjack. There are daily and special blackjack tournaments continuously at online casinos. Edward O. Thorp published a book titled Beat the Dealer resulting in his nickname as the Father of Card Counting. As a professor at MIT, he created a computer program to calculate all mathematical probabilities in Blackjack. Taking his card counting skills to Vegas, Thorp won thousands of dollars from the casinos. He formed the MIT team of students characterized in the movie 21. Ken Uston, another card counting genius, was eventually banned from entering casinos and would disguise himself so that he could continue to play. Uston, along with Al Francesco created the first card counting blackjack player teams. Stanford Wong, known for his strategy of playing at a distance only when the table’s odds were favorable to him. The strategy was nicknamed Wonging, which is banned from most casinos. Though his name indicates otherwise, Stanford Wong is not Asian. 87% of all casino players gamble 4 hours a day. You are likely to win a blackjack hand 48% of the time. Odds predict that there is a 14% chance of losing 3 consecutive hands. You are likely to get blackjack 1 out of every 21 hands. Average blackjack players can expect to go bust 16% of the time. Card counters have a 1% advantage over the house. A card dealer has 4.8% chance of getting 21. Dealers have an average of 31% chance of going bust per hand. With card counting and strategic betting, your win percentage increases with single deck play vs. multiple deck play. There are 52 cards in a deck to represent the 52 weeks of a year. The dealer’s seat to the left is called first base; the dealer’s seat to the right is called third base. If you are dealt a card total of 18 every time, you would eventually lose all your money as the dealer’s hand on average is better than 18. Edward O. Thorp’s book created more winners in casinos and forced casinos to modify the standard rules of play. 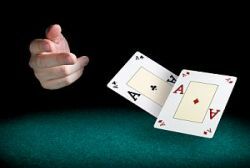 There are no laws against card counting; however, casinos use the trespassing on private property laws to ask certain blackjack players to leave the premises. In April 2011, Tropicana Casino and Resort in Atlantic City lost 5.8 million dollars to one blackjack player. Third Base is the most advantageous seat for card counters. Two of the top Blackjack movies are Rain Man and 21. A big tipper is referred to as a George.